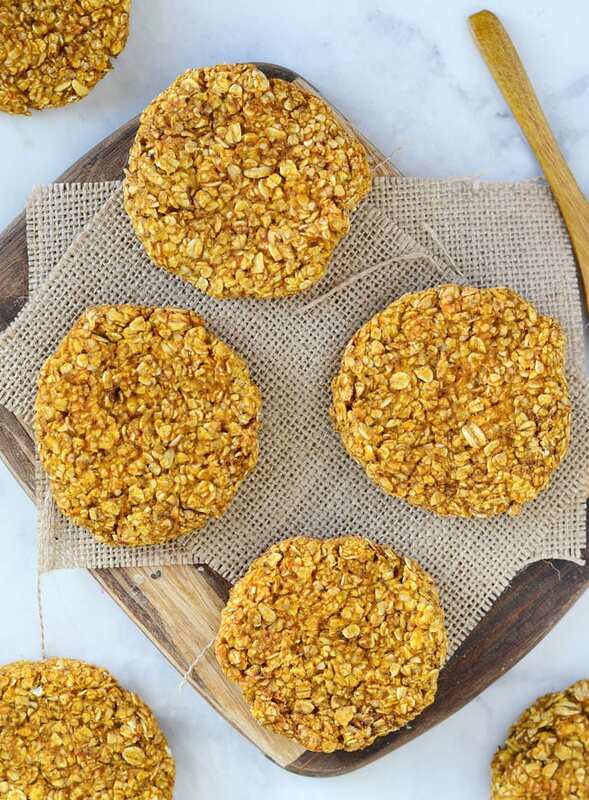 While very tasty and satisfying, these healthy pumpkin oat cookies are more functional snack than decadent treat. At just 88 calories, 1 gram of fat and 17 grams of carbs each, these cookies are the perfect pre or post-workout energizer and easy to fit into a healthy diet. If you’re after a decadent dessert cookie, this is not the recipe for you however if you’re looking for a simple, nutritious pumpkin snack, you’ve come to the right place. Yep, it’s true, you only need 3 ingredients needed to make these! Organic pure pumpkin puree, oats and sweetener. I use organic stevia to sweeten mine, alternatively you could use a little agave or maple syrup. I do recommend using the best pumpkin puree you can find as it’s flavour and texture is far superior to some of the cheaper brands out there. The best one I’ve found and my go-to for all my pumpkin recipes is Farmer’s Market Organic Pumpkin. It’s super smooth and creamy and has a delicious, subtly sweet pumpkin flavour. My favourite time to eat these cookies is part of my post-workout meal, when I’m eating most of my carbs. My post-workout meals include carbs from sources like sprouted grain toast, sweet potato, oats and brown rice, along with a protein source and some veggies. These cookies are easy to fit into part of that meal. They can also be enjoyed before a workout on their own for a quick boost in energy. Other than that, I’ll enjoy them any time because they’re yummy, hearty and satisfying! These are more of a healthy, nutrition cookie than a decadent treat, as to be expected at just 88 calories each with 1 gram of fat. I love them for a healthy pre-workout snack in the morning or post-workout to get some easy carbs in. Just a heads up in case you’re expecting a sweet, decadent cookie. These aren’t them. Enjoy these for a healthy breakfast or snack anytime of day. They’re also really good heated up and topped with some almond butter or crumbled over a smoothie bowl. Love pumpkin? You’ll want to head over and try these recipes as well! 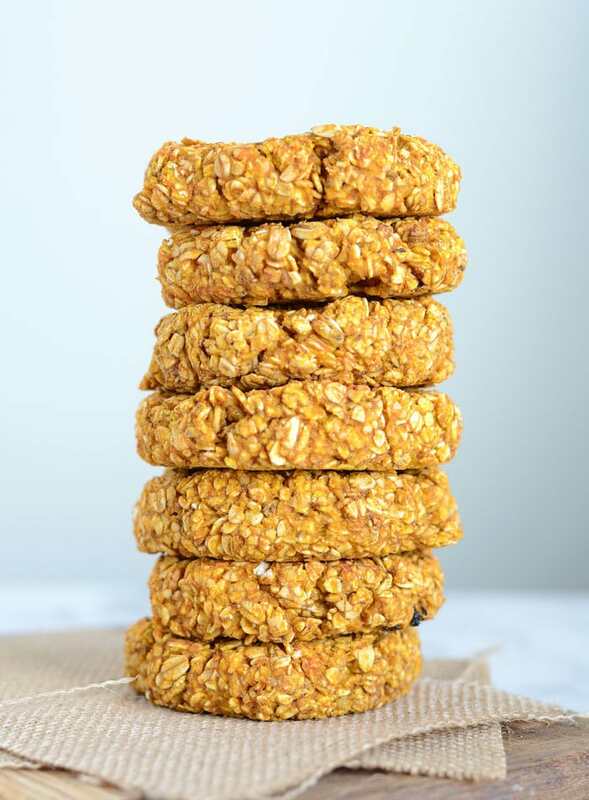 While very tasty and satisfying, these healthy pumpkin oat cookies are more simple, nutritious pumpkin snack than decadent treat. At just 88 calories, 1 gram of fat and 17 grams of carbs each, these cookies are the perfect pre or post-workout energizer and easy to fit into a healthy diet. Mix all ingredients in a bowl to form a dough. Adjust sweetness as desired. Add any optional ingredients. Use your hands to create 10 cookie shapes. Spray a baking sheet with non-stick cooking spray. Place cookies on pan and bake for 10 minutes. These are more of a functional nutrition cookie than a decadent treat. They’re almost like baked oatmeal in cookie form. You can only ask for so much at 88 calories each with 1 gram of fat. These still seem like a yummy treat to me but they are quite plain. Just a heads up in case you’re expecting a sweeter, more dessert-like pumpkin cookie. I recommend using the best pumpkin puree you can find as it’s flavour and texture is far superior to some of the cheaper brands out there and will make for a much better cookie. The best one I’ve found and my go-to for all my pumpkin recipes is Farmer’s Market Organic Pumpkin. It’s super smooth and creamy and has a delicious, subtly sweet pumpkin flavour. Wonderful! I admittedly added some ingredients so I didn’t follow the recipe exactly, but it was the perfect inspiration for a healthy, grab-on-the-go breakfast cookie. So glad it inspired you to create your own healthy cookie! If using maple syrup or honey in place of stevia, about how much would we use? Maybe a few tablespoons…taste the dough and adjust to your preferred sweetness. I would start with 2 tablespoons. How should these be stored? I made them and they are delicious, but I’m not sure what the best way to store them is. I will definitely be trying these. I’m always looking for healthy treats. Let me know how you like them! They’re very simple but hit the spot when you need a little treat. Enjoy! Are they crunchy or soft chewy? The oats, old fashion or quick oats? They are soft and chewy. You can use any kind of oats to make them. Enjoy! i have tried to freeze them and they turned out like hard rock unable to eat even if i reheated them either by steaming, baking and microwave them. I tried these with honey instead of stevia and used pumpkin pie spice and vanilla, unfortunately they were quite bland. ???? Sorry you didn’t like them Mary…how much honey did you use? You don’t need much stevia to add enough sweetness but you’d need quite a bit of honey to sweeten them up I think. Anyhow, like I mentioned in the post they’re more of a healthy, functional snack than a decadent cookie, so they might be bland for some depending on your tastes. Thanks a lot for the feedback though! I loved these! I added quite a bit of honey and also milk chocolate chips because I have a sweet tooth, but I loved how simple This recipe was! Thanks for sharing. Really kind of bland… and that’s after I added extra pumpkin, spices and stevia. 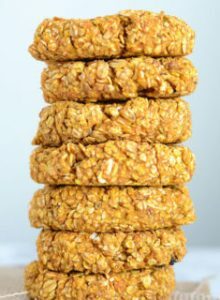 Yes, they are fairly plain but they’re more of a very healthy, quick and easy snack that satisfies that carb craving without loads of sugar. What kind of pumpkin did you use? I find good quality pumpkin puree makes a big difference. Very good vegan cookie recipe! I did not have stevia so used maple syrup to taste. I opted for unsweetened coconut and threw in a small amount of cacao nibs for good measure. I will be making these again! The perfect healthy snack…It hits the spot when craving a cookie. Thanks! I’m sorry, I’m not sure about Splenda since I’ve never used it for baking. I would just taste the dough and at a little at a time until it suits your sweetness preference. 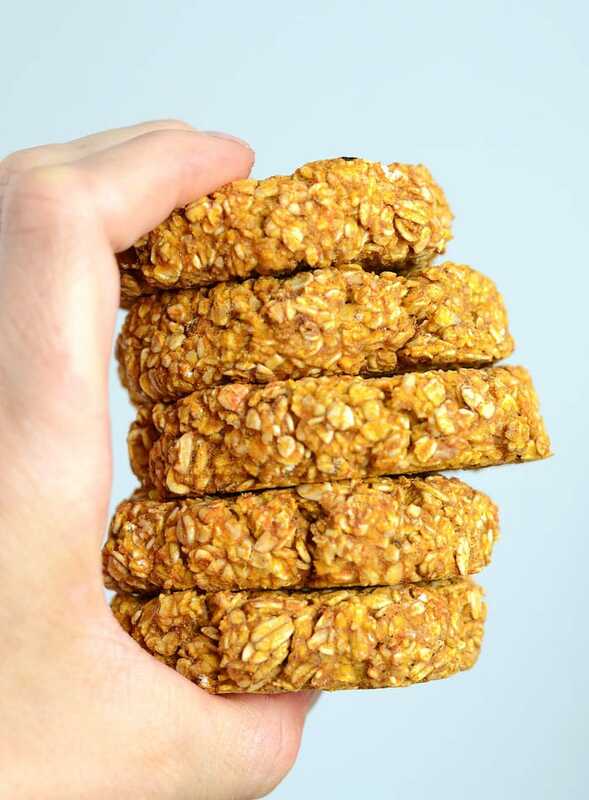 I’ve made these more than once and like them except for one thing – they have a bit of a “raw” oat taste to them. The oats taste like I grabbed a handful from the bag and ate them straight. Since the cookies are naturally dry I”m wondering what would happen if I soaked then drained the oats first? I think it would add a negligible amount of moisture. Or maybe toast the oats? Has anyone tried “softening” their oats and do you have any tips? Because other than that it’s a good easy and healthy recipe and I want to keep making it. Hmm, maybe toasting them would be good? If you soaked them first maybe you could reduce the amount of pumpkin used to account for the adding moisture? Sorry I’m not totally sure how it would effect the recipe but if you try it, let me know! Thank you for sharing this recipe ! I made these for my brother whom never eats cookies or many sweets at all and they were a hit. I have been making my own pumpkin purée for as long as I can remember and always have plenty in the freezer, so I like looking for new healthy ways to use it other than the usual pie, bread, etc. These held together and taste good even without sweeteners. Now I plan to check out your other recipes! Thanks again ???? That’s awesome, so glad you guys like them!! Thanks for letting me know. I hope you find some other recipes you enjoy! These look delicious. I have a pack of stevia. How many spoons should I use? 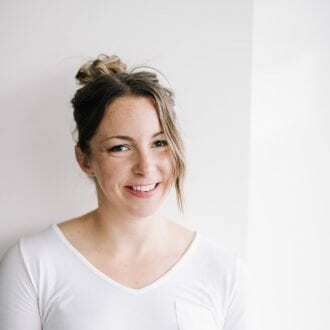 Hi Sara, I would recommend starting with a small amount such as 1 stevia packet, tasting the batter and then sweetening further to taste, if needed. Finally, a healthy cookie! Although, cookie is misnomer. These are more like an energy bar –.homemade Clif bar. I like mildly sweet cookies b/c everything you buy is laced with sweetener. But then again, I dilute my juice, 1 part juice to 7 parts water — just flavored water. You’d be surprised how your taste buds adjust. I used a cup of raisins, 1/2 c sunflower seeds (it all I had in the cupboard), approximiately 1 Tbsp honey, 1 tsp cinnamon, 1/8 tsp nutmeg, 1/16 clove, and added a little extra pmupkin puree (about 1/3 or 1/2 cup), They turned out to be kind of like a grainy fruit n’nut pemmican. Thanks for the great recipe. I am baking for my vegan granddaughter. These were one of the worst cookies or baked goods I have ever made for her. Dry and tasteless. Sorry. As I mentioned in the intro, these are more of a healthy, “functional” cookie than a dessert or treat so they’re more suited for healthy snacking and breakfasts. I’m sorry you didn’t like them. I just tried them! I added dark chocolate chips & as you stated, sweetened to taste. If you’re looking for something that will give you that healthier but just sweetened enough fix…then I think they’re perfect! I cooked mine a little longer for an even toastier flavor. I agree, they’re just “treat” enough for me but totally suitable to enjoy for a snack anytime. Dark chocolate chips are a must! Thanks for the feedback. Thanks, Amanda! I’m glad you liked them! Thanks for the feedback on the recipe, it’s really helpful for other readers. The batter should be divided into 10 cookies, so you can use that for size. thanks! These are very good for breakfast! I added the spices and used maple syrup. Thanks for the recipe! You’re so welcome. Glad you enjoyed them. I agree, they’re great for breakfast or a mid-morning snack. Just made them, love my pumpkin . Never used stevia and did 1 pack at first, thought could be little sweeter so went for 2 and I should’ve stopped at the 1 pack, added all the pumkin spices and a little nuts, they are pretty bland but it is for more of the health , they are eatable for on the go . May add a couple of chocolate chips just to help satisfy the sweet tooth part of me, but will not over do it. Thanks Margaret. Glad you enjoyed them and thanks very much for your feedback! I will take them to work as energy cookie. Can I use quick oats instead? Yes, you can use quick oats. They’ll have a slightly different texture and you may need just a bit more if the batter seems to wet, other than that it’s totally fine! Switched out a banana for part of the pumpkin, and added a little bit of flax seeds because I didn’t think it would stay together. Loved it! I put in more sweetener than it called for (I think. Made the batter to-taste) and they are perfect. Chewier than what I was expecting, so I cooked them about 5 mins extra. Will definitely make again. Awesome – so glad you enjoyed them. I love the banana addition! That’s awesome! I love getting feedback on the sweetener amounts used. Everyone has such a different taste preference. Glad you guys enjoyed them. This recipe is excellent! My husband & I have made it at least 7 times now. I don’t recommend doubling the batch although they were still very good a bit drier than I liked. We got creative a few times adding pure maple syrup coconut and pumpkin seeds, 1/2 cup each and tad more pumpkin spice and cinnamon then recommended ..again loved them. Nutritious and delicious. That’s awesome! I love the additions you used. I agree, nutritious and delicious! Thanks for the review and feedback. Thanks Lena, glad you enjoyed them!